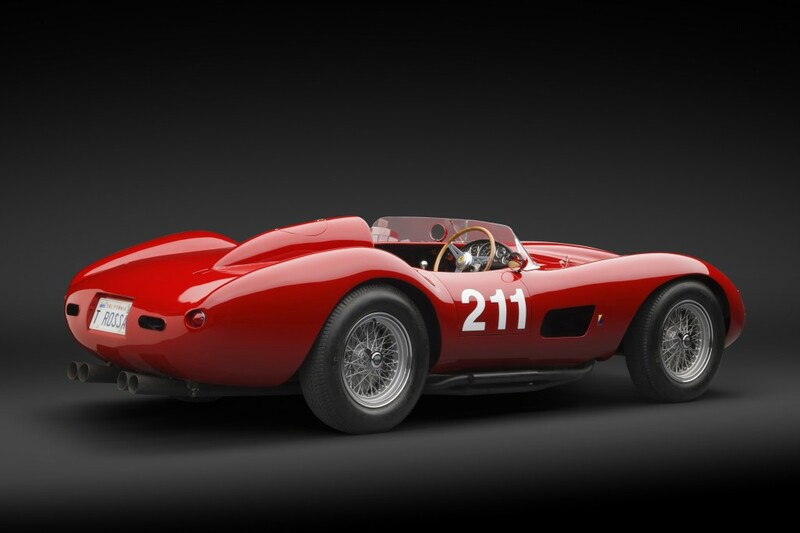 To call Ferrari’s TRC for 1957 “one of the prettiest Ferraris built”, as preeminent Ferrari historian Richard F. Merritt put it, is surely an understatement. It is a design without fault—a timeless, downright breath-taking execution of Italian motoring passion, married to one of the greatest sports racing chassis of all time, and in this particular car, complemented by an aggressively unmistakable, shiver-inducing exhaust note that the trained Ferrarista’s ear will immediately peg as that of a proper “Testa Rossa”. John von Neumann’s life story was the stuff of adolescent fantasy. Born to an Austrian family, he arrived in the U.S. as a student in 1939, joining the military during wartime and promptly beginning his sports car racing career, associating with the future ‘who’s who’ of Southern California’s car culture and co-founding the California Sports Car Club. While he ramped up his dealership activities on the West Coast with his wife Eleanor, importing the most famous (and, decades later, priceless!) European sports cars from Porsches to Ferraris, he continued his successful international racing career. On the dealership side, a young Richie Ginther helped him manage Ferrari Representatives of California, and indeed, his influence on Ferrari history cannot be underestimated. The Ferrari on offer stands in a class all its own. Offered from single ownership for the past 30-plus years, its presentation at auction may very well be a once-in-a-lifetime opportunity. 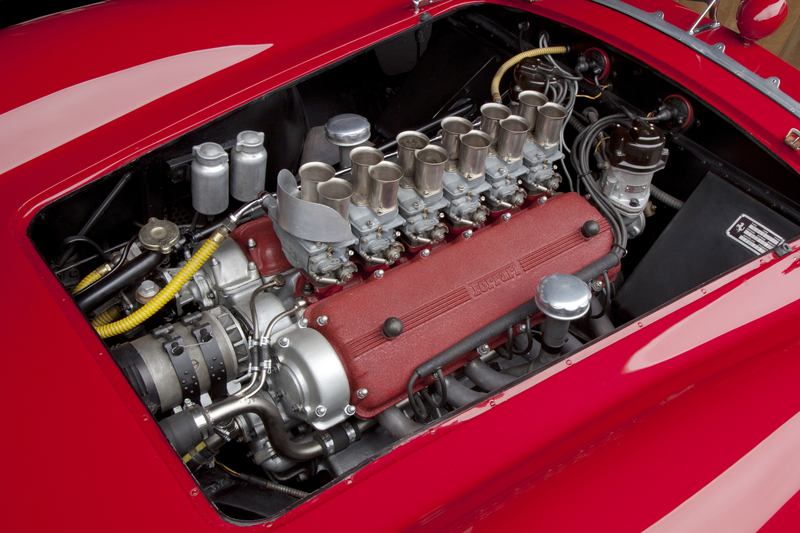 It is one of only two 2.5-litre 625 TRCs ever built by Ferrari, each specifically ordered by the larger-than-life West Coast Ferrari distributor Johnny von Neumann. According to Bill Rudd, crew chief Harold Broughton and others, the 625 TRC was von Neumann’s favourite Ferrari, partly because of its superior handling—this from a man who owned a pontoon-fendered Testa Rossa, nearly 10 four-cylinder Ferraris in all, Porsche 550 Spyders and every other imaginable world-class sports car. 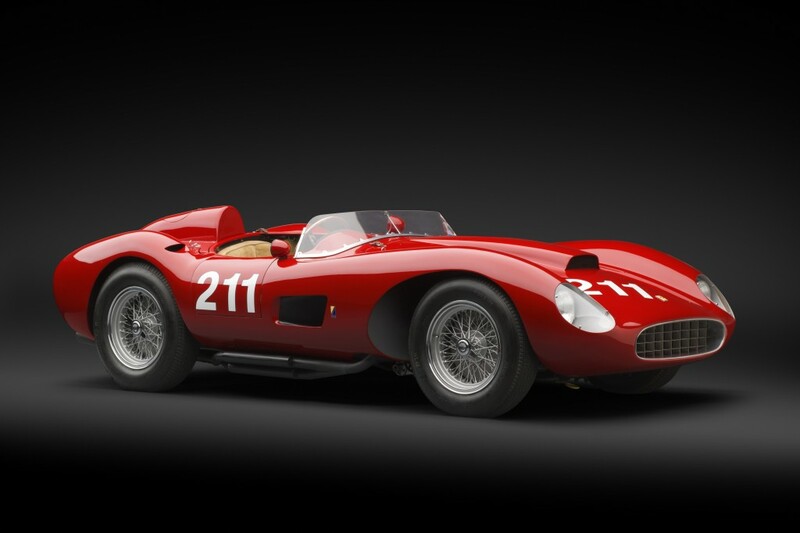 In fact, the December 1957 edition of Road & Track asserted, “both von Neumann and Ginther say that [the 625 TRC] is the best handling and easiest of all Ferraris to drive in a race”. Chassis 0680 MDTR is highly documented with complete history from new. 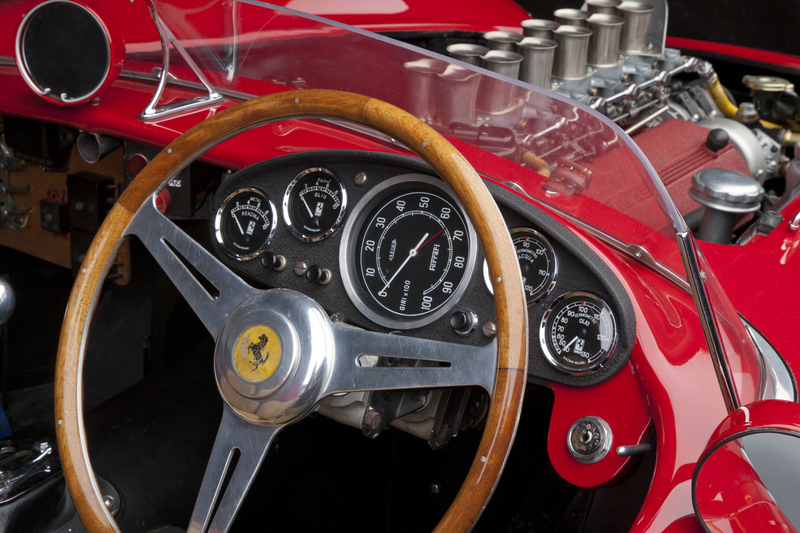 It is the ninth of only 19 TRCs of all kinds built by Ferrari in total for 1957, including the Type 500 cars. Completed on 26 June 1957, it was finished in Dark Grey Metallic with a Maroon Stripe and purchased the following month, along with its sister car 0672 MDTR, by von Neumann. 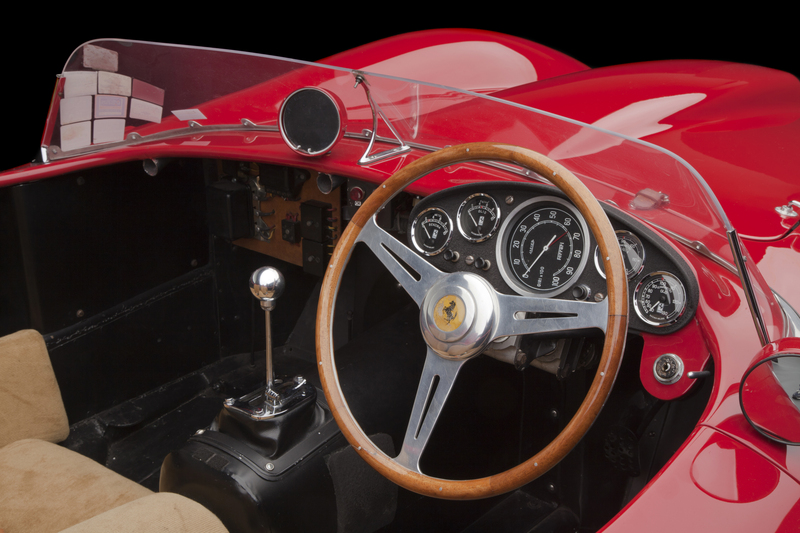 Although 0680 MDTR raced mainly in California, its first two outings were in Europe, after von Neumann personally collected it from the Ferrari factory. He first took it to Salzburg, Austria in August, 1957, where he competed in the famed Gaisberg hill climb (“Grosser Bergpreis von Östererreich”), winning his class in only the car’s first outing. The incredibly fast and agile Ferrari performed equally well in Switzerland, finishing second in the Grosser Bergpreis der Schweiz in Tiefencastel-Lenzerheide in central Switzerland. 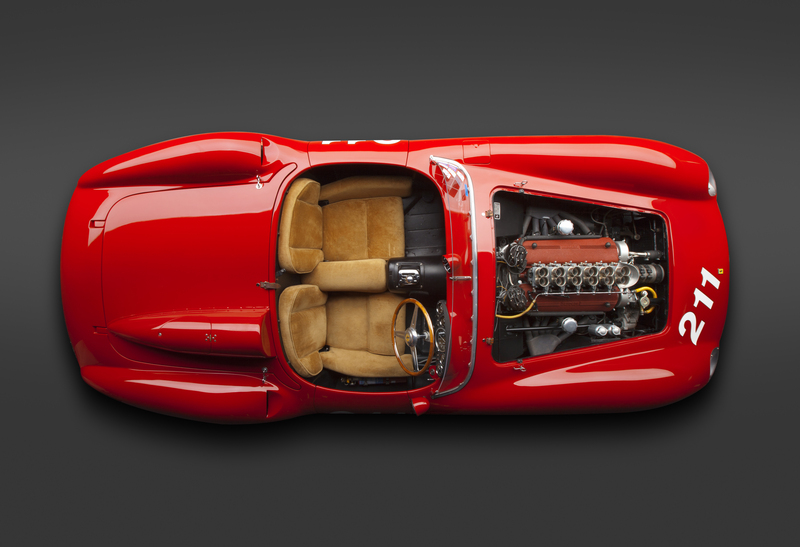 Extraordinary period images attest to this car’s successful early outings, as it powered up the mountain, leaving Maseratis, Porsches and other Ferraris in its wake. Having conquered its Alpine competition, 0680 MDTR was transported to California, where Appendix C rules did not yet apply. The car was modified during September/October 1957 with a single wraparound windscreen and metal tonneau cover. Its first race in the U.S. was at the very first race held at the famed Laguna Seca race track, which had been built for 1957 after the Pebble Beach road races were deemed too dangerous. Again, von Neumann skilfully piloted this car to a podium finish, 2nd, once again. It raced nine more times during the remainder of 1957 and 1958 at Pebble Beach, Pomona, Hawaii and Santa Barbara, with von Neumann scoring two victories and three podiums during this prolific period. Other notable race outings include Laguna Seca on 15 June 1958, with future Ferrari Formula 1 driver Richie Ginther winning with 0680 MDTR. Josie von Neumann, the daughter of John and Eleanor and an accomplished racer in her own right, drove 0680 MDTR at the Vaca Valley SCCA National race in October, 1958, finishing 5th overall and 1st in class. Surely the arrival of the grey-liveried, von Neumann-entered 625 TRC at any start/finish line on the West Coast must have utterly disappointed the competition. The 625 TRC was raced by John von Neumann at Pomona on 1 February 1959. On 26 April, Richie Ginther, the reigning 1958 Pacific Coast Sports Car champion, drove the Ferrari to a fifth-place finish at Avandaro, Mexico.